Microsoft is now with a handful of things to equip you better in the digital world. Among them tee Sway has raised a lot of curiosity for replacing the earlier Powerpoint Web Presentation. It is the latest addition to the Office family now officially been made compatible with the iOS, as well as on the web, apart from being a fully native app for Windows 10. The approach is mainly focused to the web, the process is algorithmic and purpose is to create content and a web presentation tool. But Microsoft is claiming Sway to be far more than a simple tool for these two applications. It boasts that the app is capable of transforming the entire gamut of creating interactive reports and create a different picture altogether that includes adaptive designs. 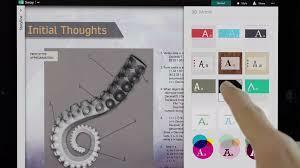 So Sway has its own appeal to get replaced at all possible devices when it is all freely and officially available to create a new definition in the world of Digital Designing. The first go of the App Sway is quite appealing with the neat and clean interface with the prominently placed, bright looking tabs like "Create New" will invite you to the easily accessible options to play with your Sway, that connects you with your contacts through the Share menu and to get a better know-how on the app, a quick-access button is there to give you a swift virtual tour of the Microsoft's Sway tutorials as you watch it on the YouTube. Get started with the Sway by going directly to the Windows Store, which is the competition thrown by the Microsoft to the Apple's Mac App Store. It costs you a data of 62MB download. You won't really need the Office 365 subscription to get it working for you, but they might ask for a Microsoft account which is an easy going process of signing up the Outlook.com email account. The app will then automatically take use of that account which any Windows 10 user will be having. 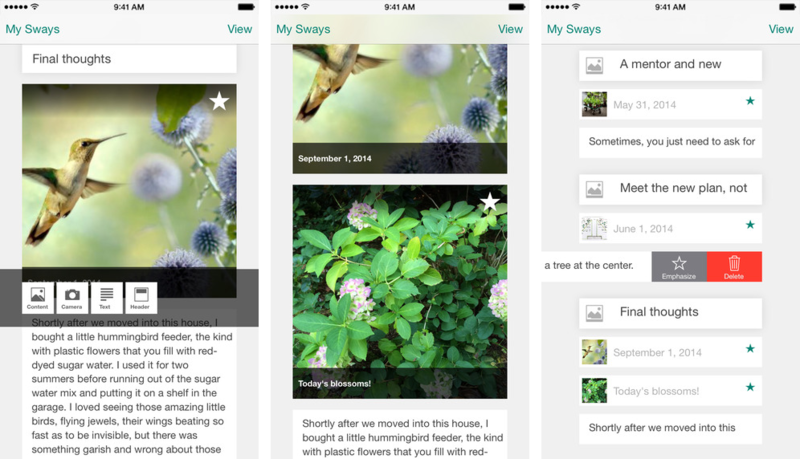 The interface of Sway is simple to the core making it all easy for the users, be it an experienced hand or an amateur. At the first glance you get to see a partially blank screen with two prominently placed tabs, one for "Create New", and another naming "Sway projects". There are also a three-line menu present at the top left corner, giving ways to five options namely, My Sways, Feedback, Create New, Open, and then the display tab of your user name. 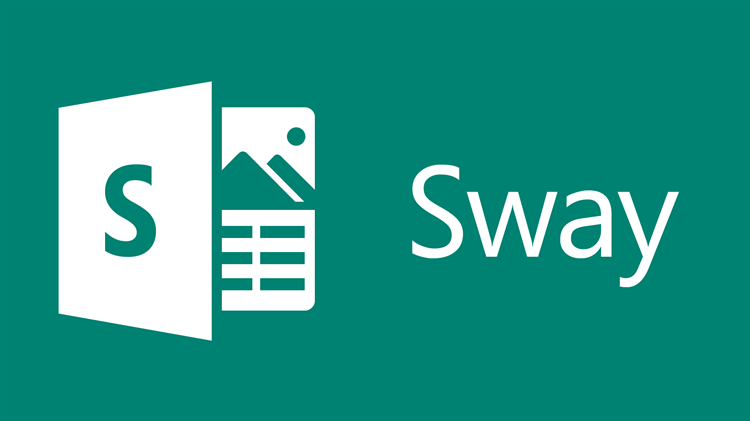 With the launch of Windows 10, Sway gets even more exciting to work with. Both the Microsoft products are made to go together for better. Once you are set with coupling both of them, the interface takes the shape of a set of sliding panels hiding themselves during the idle time. The feature that went missing from the Sway so far has come back with much more promising improvements. That is the "Undo" and "Redo" options, which are a must for any computing work. This surprising new thing in it is the Remix! A button for a spin. So recovering an earlier stage isn't an issue any more. After a lot of negative responses, the "bullets and numbering" feature has undergone some major changes especially to the text tool bar, that is appearing at the Storyline top whenever a text card is created. In Sway one can edit the captions and headings directly from the canvas simply by clicking on them and then editing them as per their requirement. They have also made it possible to edit text from the paragraphs of the work sheet. There "click" and then select the "Edit" option and make the necessary changes. Now Microsoft has taken all the suggestions in a serious note and have incorporated the option of importing PDF files directly into the Sway. Now using content directly from the PDFs or from any other multimedia is far more convenient than before and that really brought a great change into the program. It has made an easy way to bring in fresh ideas and convert them into the shape you want them. The process is as simple as going to the "My Sways" page, "click" the Import button, then go "selecting" a PDF file. A new Sway file will be created that consists the content of that PDF as its basic framework. Otherwise from an existing Sway, you can go for the Upload option and then select a PDF to get ideas from its content merged into the part where you want it to get absorbed. If you watch closely and make a comparison, Sway will appear to be like an assistant for your digital design that helps you in visualizing, rendering and finally producing digital designs bringing out the best in you. The usability of Sway lies in the fantastic way it keeps suggesting content for the project the user is currently working upon. It is generated on the basis of what entries you have fed in it on the previous card. The interface is highly intuitive. You get a good number of features like awesome responsive designs in the default setting by Autosaves. Easy publishing to the Web. What is the most captivating factor is the Simplicity of the interface. The Sharing and collaboration features also make it more appealing. Projects can be accessed online and Integrated with the third-party services as well. You don't get advanced navigation options like those website building sites. Neither can you work with any files by downloading them or transferring. The granular layout controls went completely missing as the cloud storage options. The workspace gets disjointed at times. You might have to bear with sudden functional errors while trying to open a project through different devices. 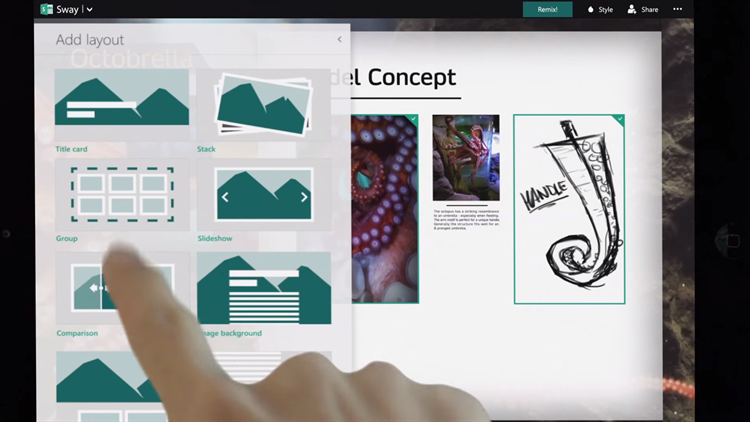 Microsoft's Sway has has shown us an advanced way of creating presentations particularly crafted for the Web. It has undoubtedly taken a step forward in the arena of content as well with a new definition of how you can connect to the world. So it is worth investing for both the Graphic and Content Specialists and give it a try.